On 1 October 2009, Pan African Space Station hosted Udaba, in collaboration with spoken-word author and filmmaker Kgafela oa Magogodi, at The Centre for the Book, Cape Town. Udaba is a musical flurry of passion, soul, soothsaying, truth-telling and jazz poetry that takes you on flights of improvisational abandon. Their politically engaged elegies fuse vernacular lyricism, Xhosa praise singing and African indigenous music on jam-like sets with a rotating crew of regular collaborators. 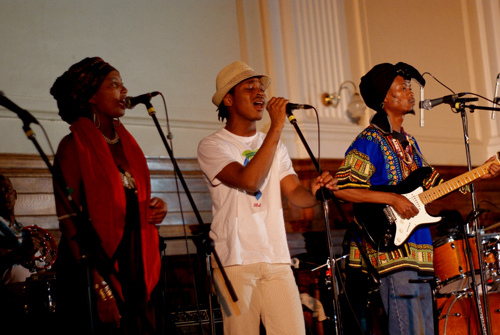 Udaba draw their inspiration from Xhosa literature and refer to their music as Umculo Buciko (musical essays). Based in the Eastern Cape, they regularly perform at gatherings, poetry jams, festivals and clubs and recently released their debut album Umculo Buciko. Category: Pass Blog | Tags: Kgafela oa Magogodi, Udaba | Bookmark: permalink.